The beleaguered Sharif family took another hit as the National Accountability Bureau has decided to file a case against Hamza Shahbaz in the Ramzan Sugar Mills case. The latest case in the accountability campaign puts a question mark over the future of the political dynasty. Hamza Shahbaz is often seen as the last hope of the Sharif dynasty. “NAB has decided to file a reference against Hamza Shahbaz for his alleged role being chief executive of the Ramzan Sugar Mills to get constructed a bridge facilitating his mills out of the public money in Chiniot,” a senior official was reported to have said. Though cases against his father are ongoing, it is expected that he will have the same fate as his elder brother. A formal approval for filing the reference will be given by NAB Chairman Justice (r) Javed Iqbal, reports quoted an anti-graft watchdog official as saying. The NAB has already acquired the asset details and bank records of both Shahbaz Sharif and Hamza, whereas permission to question the former Punjab chief minister in jail has also been granted to the bureau. Hamza has twice appeared before NAB in cases pertaining to the accumulation of assets beyond known sources of income and Ramzan Sugar Mills case. NAB had launched an investigation against the PML-N leader and his brother Salman Shahbaz for allegedly amassing assets beyond means of income. Hamza had earlier obtained protective bail from the Lahore High Court (LHC) to avoid his possible arrest as witnessed in his father and other PML-N leaders’ case. Earlier on October 30, both Hamza and Salman Shahbaz had not appeared before NAB in the Ramzan Sugar Mills case. NAB had summoned them both along with the directors of Ramzan Sugar Mills over illegal construction of a bridge from national exchequer to facilitate their mills, allegedly causing a loss of Rs 200 million. Hamza is also being probed by the anti-graft watchdog in the Saaf Pani Company scam. His brother Salman meanwhile has fled the country. Hamza Shahbaz was seen as the last hope of the Sharif dynasty as he was deemed as the successor and replacement of his father, Shahbaz. The beleaguered Sharif family took another hit as the National Accountability Bureau has decided to file a case against Hamza Shahbaz in the Ramzan Sugar Mills case. Hamza was slated to be the Chief Minister of Punjab if the PML-N had gotten control of the province. He did try to govern the party after the disqualification of his uncle and the arrest of his father. However, his efficacy as a leader has been doubted by many. On 18 December 2018, A PML-N deputy mayor quit the party after an exchange of harsh words with Hamza Shahbaz. 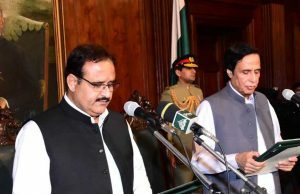 The incident took place in Model Town party secretariat where Lahore Deputy Mayor Wasim Qadir exchanged harsh words with Hamza, also the opposition leader in the Punjab Assembly, over the award of a ticket for a vacant councillor seat. Hamza reportedly hurled a water bottle at Qadir for arguing over the matter, which aggravated the situation If Hamza is arrested like his father then one can expect the extinction of the Sharifs in the political arena. Though cases against his father are ongoing, it is expected that he will have the same fate as his elder brother. The rest of the Sharif dynasty is out of politics. The Patriarch of the Sharif clan, Nawaz Sharif, was disqualified earlier by the Supreme Court and then imprisoned for seven years after being found guilty of corruption in the Al Azizia reference case. His daughter and heir apparent Maryam Nawaz was disqualified for 10 years in the Avenfield reference case. Hamza’s father Shahbaz was arrested in October 2018 by NAB in the Ashiana Housing Case. Already the PML-N is reeling from a “lack of Sharifs”. The main opposition party has gone largely silent and has been reduced to a mouthpiece protesting against the accountability process against its leadership. It has been replaced as the “opposition” by the numerically inferior PPP. Will NAB bow down to the opposition’s mounting pressure? Shahbaz Sharif Arrested: What Next?